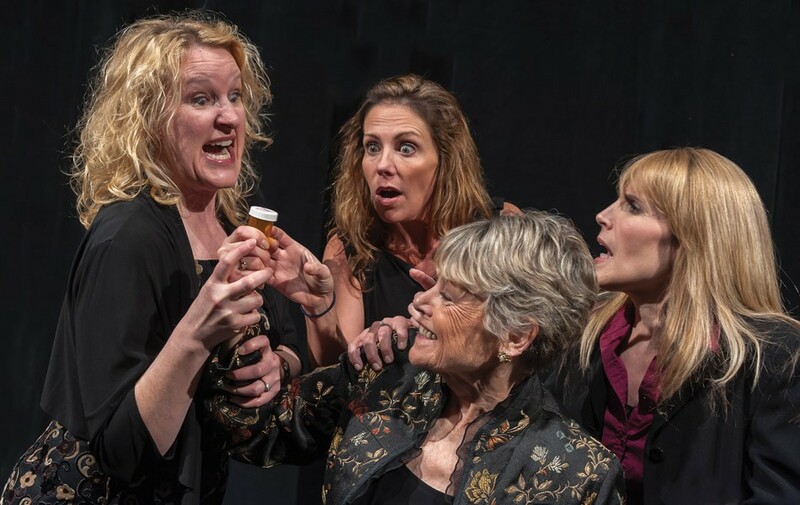 THEATER REVIEW: "August: Osage County"
PHOTO BY STEVEN LEVINSON Clockwise form left: Daughters Kerry Young, Stephanie Sheak and Allison Roberts, try to detox their mother, Denise Bartalo in "August: Osage County," now at JCC Centerstage. After it debuted in 2007, Tracy Letts' drama "August: Osage County" won just about every theater award that matters — Tony, Drama Desk, Pulitzer, New York Drama Critics' Circle, etc. The play itself is extraordinary, even though the subject matter is about as ordinary as you can get. A far-flung extended family is brought back together, and once the members are all contained in close quarters, long-simmering tensions reach a boil and long-buried truths explode. I don't know about you, but that describes basically every one of my family gatherings. What makes "August: Osage County" so special is the complicated, very human characters; the intricate Jenga-like layering of plots and subplots; and expertly crafted dialogue with lines so vicious they make "Who's Afraid of Virginia Woolf?" look like "Hello Kitty." At three-plus hours, it's a hell of a challenge. But the cast and crew at the JCC Centerstage are up to the task, and this show features some of the finest acting I've ever seen on a Rochester stage. The play concerns the Weston clan of Pawhuska, Oklahoma. It opens with patriarch Beverly Weston (David Munnell) hiring young Native American Johnna (Sara Michelle Bickweat) to be a live-in aid, helping with cooking and cleaning and chores around the house. The Westons could use the assistance, as Beverly's wife, Violet (Denise Bartalo), is dealing with a diagnosis of mouth cancer, as well as a long-standing prescription-drug habit. Things quickly become tense when Beverly disappears after the opening scene. Eventually Violet calls in the rest of the family, including nearby daughter Ivy (Allison Roberts); Violet's sister and brother-in-law, Mattie Fae and Charlie (McKenzie Keenan and Peter Doyle); and Colorado-based daughter Barbara (Kerry Young) and her husband and teenage daughter. As the family waits for word on Beverly, they start to hash out their own individual dramas, of which there are many. On opening night Act I was a mixed bag. There were pacing issues, mostly due to Beverly's long, languorous monologue that opens the show. But even after that the first section felt as though the gears were jammed; the action didn't shift smoothly. There were also at least two instances on opening night where it seemed that the actors were stumbling over lines early in the play, and they had to do a bit of verbal tap dancing to get around it. Any issues disappeared instantly with Act II, and from there on, the show and the cast caught fire. The second act in particular is so tightly directed that you can't look away for even a second. Director Brian Coughlin makes several interesting staging decisions that add to the emotionally voyeuristic feeling of the show. Following an incredibly brutal family dinner, there is a chase sequence that could have easily been played solely for laughs (the show is a dark comedy, but a very dark comedy), but instead became a potent mix of the ridiculous and the desperate. The tension lets up a bit in the third act, even though the play delivers several more dramatic nuclear blasts. The realism of the characters and the difficult truths of their relationships really shine as the story reaches its conclusion, and by the end of the show it feels like everyone has run an emotional marathon. That was true for both the cast and the audience; several people sitting behind me were getting anxious by the end of the show, audibly wondering when it would end. But still they exploded into a standing ovation at the curtain call. Every actor in the 13-member cast delivers a good-or-better performance. But two in particular produce remarkable, career-defining work. Denise Bartalo looked completely exhausted by the end of the opening-night performance, and with good reason. Her take on battle-axe matriarch Violet is astonishing to behold. Violet is such a difficult character, and requires an actor to believably play looped-out-her-mind on pain pills, sharp-eyed and sharper-tongued harpy, and finally oddly sympathetic but still irredeemable survivor. There's not a single off-pitch note in Bartalo's portrayal of this complicated woman, and she is so believably, casually ruthless in the second act that I found my pulse racing just listening to her berate and cajole. Matching her blow for emotional blow is Kerry Young as eldest daughter Barbara. Barbara doesn't come in until late in Act I but quickly becomes the ostensible heroine of the play. Young has played a variety of dramatic roles on local stags, and is also the founder of Unleashed! Improv. That blend of pathos and crack comedic timing makes her ideally suited for this show; her wry delivery of even some of Barbara's most caustic lines helps to cut through the almost palpable bitterness. As impressive as Bartalo's Violet is — and she really is wonderful — she needs an equally strong Barbara to play off of, and Young never lets her down. There isn't sufficient space to go over all of the cast's contributions, but other stand-outs include Matt Ames, who reads "sleazeball" as soon as he saunters onto the stage; Allison Roberts as Ivy, who lives up to her character's namesake as unassuming but hiding something destructive underneath; McKenzie Keenan as the forever-exasperated Mattie Fae; Peter Doyle as arguably the lone voice of sanity in the entire family; Steven Marsocci as the nice guy who maybe isn't so nice; and Sara Michelle Bickweat as the unassuming Johnna, the outsider who allows us to see just how monstrous these people are by comparison. Clockwise from left: Kerry Young, Stephanie Sheak, Allison Roberts, and Denise Bartalo in "August: Osage County," now at JCC Centerstage.